CHARLOTTE AMALIE — Officials said Carnival Cruise Lines is flying 770 passengers to Puerto Rico after their ship caught in fire in St. Thomas Monday morning. The president of the company that manages the dock where the ship is berthed says six chartered flights were headed Wednesday to Puerto Rico. Joseph Boschulte of the West Indian Company Ltd. said another 177 passengers were flown to Barbados on Tuesday. He said the cause of the fire has not been determined. The fire occurred Monday at 11:30 a.m. in the engine room while the Carnival Liberty was docked in St. Thomas. No one was injured by the fire, which was extinguished by the ship’s onboard sprinkler system. The cruise was on a seven-day Caribbean cruise with 3,346 guests and a crew of 1,150. Carnival Cruise line said Thursday the remaining 2,399 passengers aboard have the option of flying home or staying on the vessel when it departs St. Thomas on Sunday as availability permits. “All future cruises, including the next voyage departing Sunday, September 13, are scheduled to operate as planned,” the cruise line added. The cruise line also confirmed that some guests aboard the ship have already been flown home from St. Thomas. Carnival has already issued an apology for the unexpected disruption, pointing out that all guests will receive a full refund for the cruise in addition to a 50 percent discount on a future sailing. Meanwhile, $150 per person credits have already been applied to guests’ shipboard accounts. 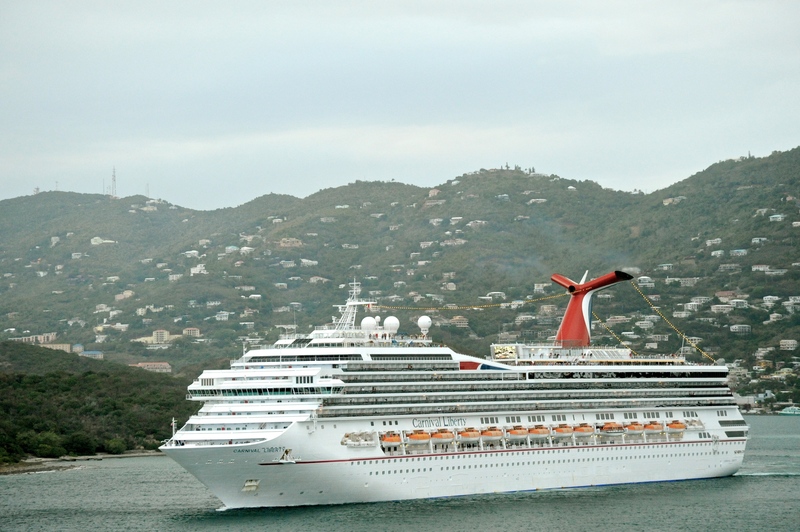 Although the guests onboard the Carnival Liberty were forced to disembark at the dock in St. Thomas when the fire broke out Monday morning, no injuries were reported and the blaze did not impact key hotel services including air conditioning, elevators, toilets, and galleys. “All guests are being accommodated on board until their scheduled charter flights depart and are free to enjoy the beaches, shopping, watersports and variety of activities available in St. Thomas,” Carnival said in the statement. The Carnival Liberty was on the second day of a seven-day Caribbean cruise when the fire occurred. The investigation into the cause of the incident is ongoing.